We humans share Earth with 1.4 million known species and millions more species that are still unrecorded. Yet we know surprisingly little about the practical work that produced the vast inventory we have to date of our fellow creatures. How were these multitudinous creatures collected, recorded, and named? 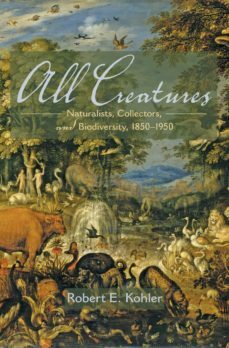 When, and by whom?Here a distinguished historian of science tells the story of the modern discovery of biodiversity. Robert Kohler argues that the work begun by Linnaeus culminated around 1900, when collecting and inventory were organized on a grand scale in natural history surveys. Supported by governments, museums, and universities, biologists launched hundreds of collecting expeditions to every corner of the world. Kohler conveys to readers the experience and feel of expeditionary travel: the customs and rhythms of collectors daily work, and its special pleasures and pains.A novel twist in this story is that survey collecting was rooted not just in science but also in new customs of outdoor recreation, such as hiking, camping, and sport hunting. These popular pursuits engendered a wide scientific interest in animals and plants and inspired wealthy nature-goers to pay for expeditions. The modern discovery of biodiversity became a reality when scientists desire to know intersected with the culture of outdoor vacationing. General readers as well as scholars will find this book fascinating.